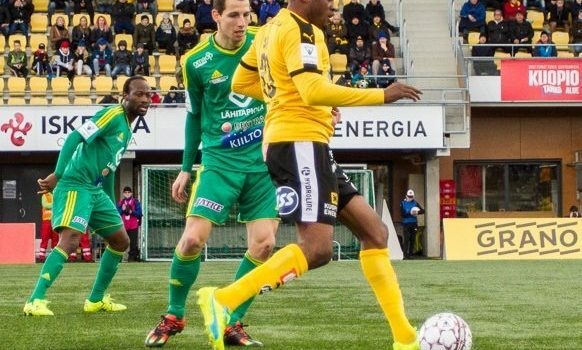 Nigerian striker, Gbolahan Salami scored his 13th goal of the season for Kuopion Palloseura (KuPS) in their 2-0 away victory to HIFK Fotboll in the Finnish Veikkausliga at the Sonera Stadium on Monday. Salami opened scoring for The Yellow-Blacks in the 15th minute, before Finnish midfielder, Petteri Pennanen doubled the lead in the 83rd minute to end the game 2-0 in favour of the away team. The former Warri Wolves striker, who scored last Friday for KuPS in their 2-1 loss to RoPS, gave good account of himself again by inspiring his side to a comfortable 2-0 victory, thereby increasing hisgoal tally in the current season. The Nigerian duo of Salami and Azubuike Egwuekwe were in full time action for KuPS, while former Sunshine Stars midfielder, Paul Onobi picked the starting shirt, but later made way for Patrick Poutiainen in the 68th minute.